On the second day of spring we awoke to snow-covered lawns and big flakes swirling in the air. Most of the early spring flowers had opened at least a week ago. 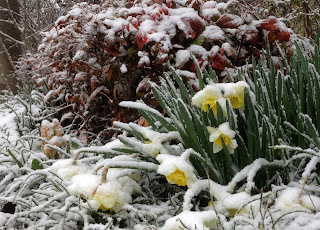 Now the daffodils and hyacinths hung their heads, struggling under the weight of the snow. It looked as if a pastry chef had swept in overnight and sprinkled our gardens with a heavy coating of sugar. It was magical but also distressing. Across the street lives a stately old magnolia, whose big pink flowers had opened a few days ago. Petals were shriveling and dropping almost as fast as the snowflakes were falling. But the daffodils will be okay.